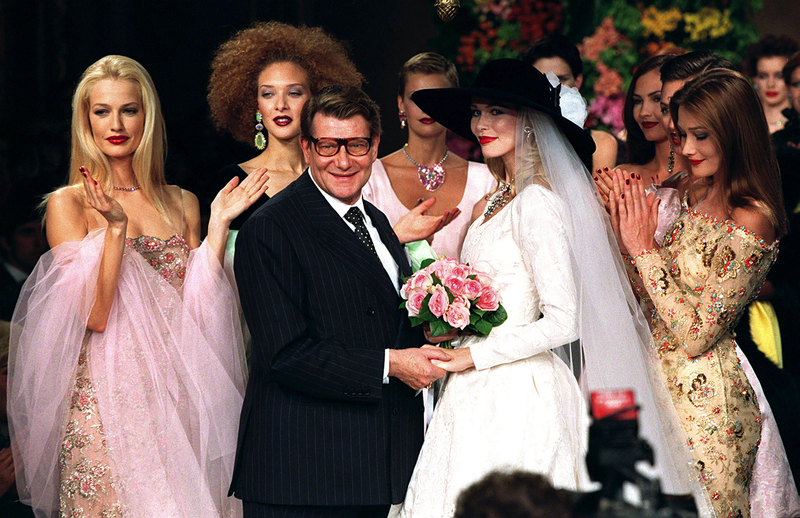 French fashion designer Yves Saint Laurent holds the hands of German model Claudia Schiffer as Dutch model Karen Mulder (left) and Italian Carla Bruni (right) and other models behind, applaud following his Autumn/Winter 1996 high fashion collection, July 10, 1996. On Aug. 1 the great French designer would have been 80. His affection for Russia started in the 1950s and has lived on even after his death in fragrances and cosmetics released by the brand. We take a look at the legendary couturier’s connections to Russia. After the sudden death of Dior’s founder Christian Dior in 1957, 21-year-old Yves Saint Laurent become the head designer of the House of Dior. His first collection Trapezium, which appeared a year later, played with the form of a traditional Russian sarafan. Some costumes were given Russian names – Nadezhda, Tatyana. In 1959 Yves Saint Laurent became the first Western designer to bring his collection to the USSR. The show caused a furor. Of course it was nearly impossible to get in: Invitations were given only to chiefs of the light industry, cinema and theater stars and wives of the party leaders. However, everyone had the opportunity to see the models later when they came out to the Red Square and the GUM’s (Russia’s main department store) halls for a photo session. The photo archives of the time capture the scene: The Russians look at the models in Dior dresses as if they are aliens. The designer stated that he loved Russia and its culture, the influence of which is notable in many of his works. However never did it manifest itself as obviously as in his fall-winter collection 1976, devoted to Diaghilev’s “Ballets Russes,” which ran in the early years of the 20th century in the theaters of Paris and New York. The heroines of Russian literature, mainly Natasha Rostova and Anna Karenina, also inspired the designer. Saint Laurent found one of the most interesting interlocutors in her: “I could freely speak about everything with her – about love affairs, honesty, painting, even about politics… And of cause about fashion,” he said. The designer gave her many of his costumes as presents; on her 85th birthday he gave her an evening dress, which she loved very much and wore often, regardless of etiquette, which prohibited the wearing of the same dress on more than one occasion. It was the writer Elsa Triolet, Louis Aragon’s wife and the sister of Lilya Brik, who introduced fashion trends and designers to the legendary Russian ballet dancer Maya Plisetskaya. Yves Saint Laurent couldn’t help admiring the world-renowned ballerina. The designer created her costume for the Mahler ballet Death of the Rose. The weightless, delicate pink garment, which seemed to have been sewn from rose-petals and didn’t hamper Plisetskaya’s movements at all, was a real shock for the whole wardrobe department of the Bolshoi Theater and suited very well the sensual, dramatic and innovatory spirit of the performance. In 2008 the designer who transformed the fashion world died. However the fashion house that bears his name is still devoted to his passion for Russia and continues to release models inspired by this country from time to time. The Magnificent Blossom Oriental Collection 2015 Russian Limited Edition fragrance was designed specially for Russia, and in 2014 a cheerful eye shadow palette devoted to Yves Saint Laurent’s ever-lasting love – Russian ballet – was launched.